This project is intended to provide a long lasting solution to the various problems experienced along Thompson Creek.The most obvious problems have been flooding, erosion, and property damages to public and private property adjacent to Thompson Creek throughout the City. These problems are symptoms of the impacts of urbanization in the watershed over the decades.Various efforts to address the effects of flooding and erosion have been undertaken by the City since the mid-1970s. 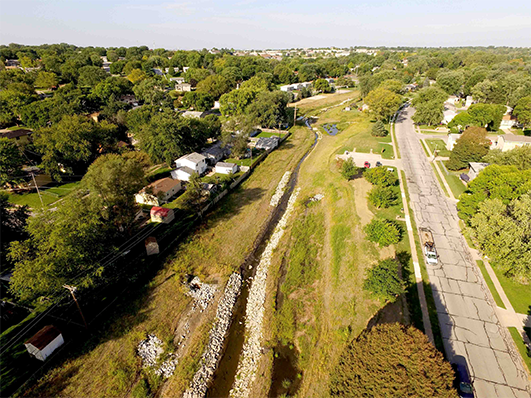 Recently the City acquired 24 homes along Thompson Creek between Edgewood Blvd. and 72nd Street.These acquisitions have provided the opportunity to restore a large section of the Thompson Creek channel.In conjunction with improved watershed management to reduce storm water runoff volumes and improve water quality, Thompson Creek will be transformed from being considered a problem to being viewed as a natural resource to be enjoyed and preserved by the community. Funding provided by Nebraska Environmental Trust, Nebraska Department of Environmental Quality and the Papio-Missouri River NRD.